Mohamed Diagayété, “Africa's Islamic Heritage in Peril? An Insider's Account of the State of Timbuktu's Arabic Manuscripts"
Please join us for a rare opportunity to hear from the director of the most important Arabic manuscript archive in West Africa, the Institut Ahmad Baba in Timbuktu (Mali). Timbuktu was historically one of West Africas most important Muslim intellectual centers. Chosen as a site for a UNESCO-sponsored public archive and research center for Arabic manuscripts in 1967, it was named after the famous Timbuktu scholar Ahmad Baba (d.1627). Yet in 2012, jihadists affiliated with Al-Qaeda occupied the city, and they chose the Institut Ahmed Baba as their local headquarters. Protecting the Instituts manuscript holdings was a difficult task during the jihadist occupation, which ended in January 2013. Since then, the Institut has struggled to reconstitute itself as a functioning archive and research center. 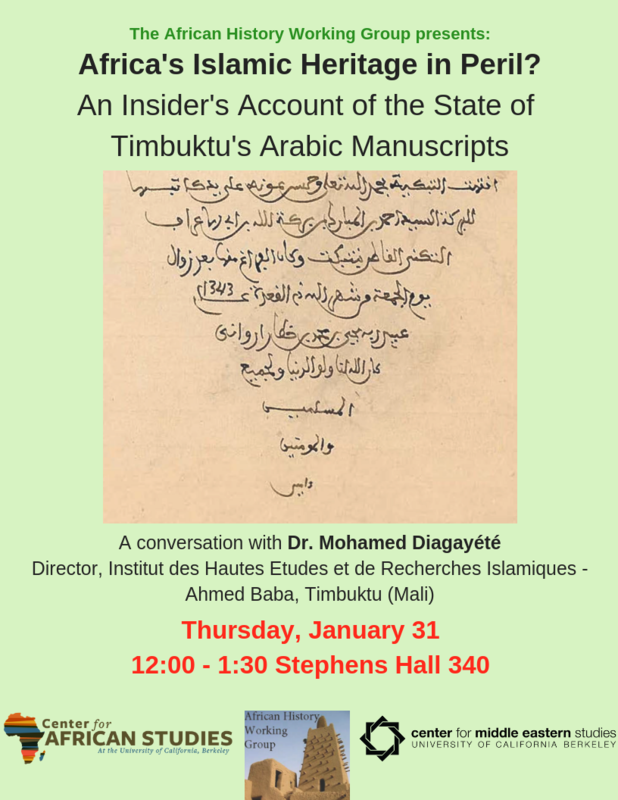 The Instituts director, Dr Mohamed Diagayété, will discuss some of this history, in addition to offering an account of the state of the manuscripts and the research projects being sponsored by the Institut. The discussion after the presentation will be led by Professor Bruce Hall (History), who has worked extensively at the Institut. Presented by the African History Working Group. Co-sponsored by the Center for Middle Eastern Studies and the Center for African Studies.